As the previous post showed, mmls is a very useful tool when being used to list all partitions and unallocated space on a disk. It not only shows the starting and ending sector, but also gives the information about the type of the partition. However, this piece of information could be wrong and misleading. In the previous example, I introduced how the mmls recognizes the type of the file system of a partition. It reads the partition table record, finds the partition type flag, then determine the partition type based on the value. But the value of this flag can be modified manually, which means the mmls tool may provide wrong information about the partition type. Let us see an experiment. In this experiment, I created a partition on a USB drive then modified the partition table record to mislead the mmls tool. This experiment is done in OpenSUSE OS with the help of YaST2 Partitioner program. First, I took a USB drive and delete its original partitions. 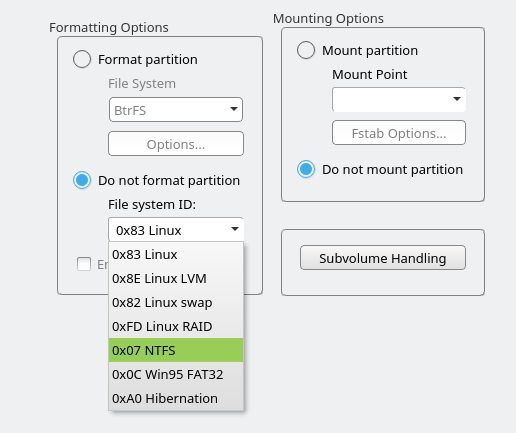 Then, I created a new primary partition and formatted it with Ext4 file system. The partition started at offset 2048 was the one I just created. The description showed that it was a Linux partition, which is expected. 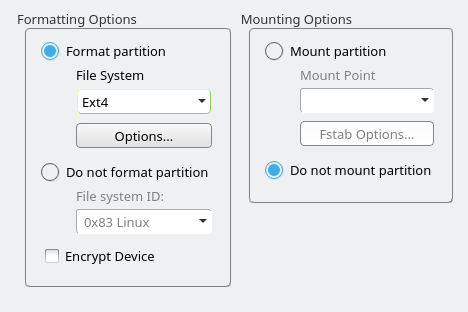 The fsstat clearly told us that the file system of this partition was Ext4. Next, it’s time to hack the partition table. I opened YaST2 Partitioner, selected the partition just created, clicked the “Edit” button. In the following window, there was a pane named “Do not format partition” with a dropdown list. In the dropdown list, I selected “0x07 NTFS”, then continued and finished the edit. Everything stayed the same, except that the partition was now recognized as with an NTFS file system! How did this happen? By looking at the partition table in master boot record (MBR), we were able to find out the reason very easily. So by comparing the two values, we could figure out that the partition type flag was modified from 0x83 to 0x07 by YsST2 Partitioner. Since 0x83 stands for Linux file system and 0x07 stands for NTFS, the mmls tool showed different descriptions based on the different flag values. Luckily, the fsstat tool still determine the file system of the partition correctly, not being affected by the hacking of partition table. The file system of partitions listed in mmls result is simply based on the flag value in the partition table. It does NOT necessarily show the real file system of partitions. To determine the file system of a partition, fsstat is a more reliable tool available in The Sleuth Kit.